In addition to Voltaire.net, the other original report was provided by Damascus-based Syrian journalist Said Hilal Alcharifi. Although these initial reports describe the individuals in question as “NATO” officers, it’s unlikely they would have been carrying NATO colors on a covert operation – and might be more accurately labeled as US Coalition officers. Note that early reports suggest that these are not standard ‘street rebel’ or jihadi terrorists but actual Coalition military personnel and field commanders. 21WIRE have also received unconfirmed reports yesterday that militants had fired a missile intoRamousa area and then tried, unsuccessfully, to get cars out of East Aleppo. It’s possible this incident could be related to today reports of captured western operatives. 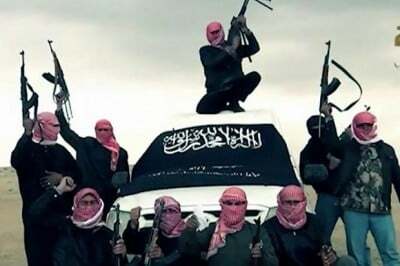 “The agreement on evacuating militants and weapons from the eastern neighborhoods of Aleppo city has been suspended after terrorist groups breached it, special sources told SANA correspondent in Aleppo. Earlier, SANA reporter said that the terrorist groups have breached the agreement as they smuggled heavy weapons, including TOW missiles, heavy machineguns and kidnapped people via the buses and cars transporting terrorists and their families towards the southwestern countryside of Aleppo city. The reporter added that the terrorist groups fired shells and sniper bullets on the buses and ambulances at al-Ramousseh crossing, noting that the Syrian Arab Red Crescent (SARC) and the International Committee of the Red Cross (ICRC) which are supervising the evacuation process had to withdraw all buses and cars from the crossing. If true, then this latest news would also mean that both the Syrian and Russian governments would have additional leverage going forward in any bilateral negotiations with the US-led Coalition. If, however, this story is kept under wraps by NATO member governments and summarily blacked out by the US and European media outlets, then it might indicate that a deal has been struck, albeit behind the scenes, for the return of captured NATO operatives in exchange for other concessions. If today’s report from East Aleppo is accurate, this might also help explain the hysterical behavior by the US State Department and western UN officials who have been demanding “an immediate ceasefire” – despite the fact that 99% of East Aleppo has already been liberated by Syrian government forces. Not surprisingly, aside from unnamed “UN sources”, Weiss claims to have got his information from none other than the discredited US and UK-financed pseudo ‘NGO’ known as the White Helmets. This report was neither admitted, nor was it denied by US Coalition sources at the time. However, one mainstream Israeli source, The Times of Israel, did report the incident. For anyone who has been paying close attention to the Syrian Conflict, seeing NATO special forces or “contractors” working with ‘rebel’ or terrorist fighters inside of Syria is nothing unusual. Numerous reports have been filed of British soldiers assigned to fighting groups to help with training, strategy and logistics. In June 2016, The Telegraph admitted that British special forces were helping one rebel group, “… with logistics, like building defences to make the bunkers safe,” said one ‘rebel’ fighter. Other reports, including the LA Times which detailed CIA operations used to arm militants, including Al Nusra Front (al Qaeda in Syria) who were the terrorist force in charge in East Aleppo. Other revelations of US covert involvement include The New York Times,and also information on US (NATO by another name only) covert operations provided to the Wall Street Journal. Throughout fighting in the Donbass in eastern Ukraine, during the period of May 2014 to the present, numerous incidents have been reported where NATO military soldiers and operatives have been both spotted, and captured by rebel forces, and in most cases these reports have been muted, more than likely because of ‘horse trading’ taking place as an extension of wider diplomacy. Contributors to this report were Patrick Henningsen and Vanessa Beeley.